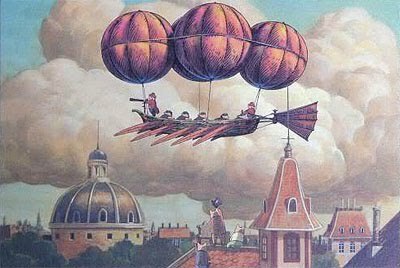 Imaginary Flying Machines (Kuusou no Sora Tobu Kikaitachi) is a 2002 short film directed by Hayao Miyazaki, and created exclusively for the Ghibli Museum in Mitaka, Japan. It is devoted to Miyazaki's favorite subject, aircraft. 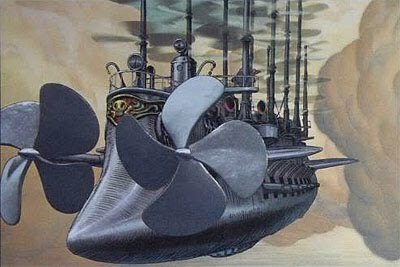 The visual imagery evokes Jules Verne, Fritz Lang, Albert Robida, and what is known as "steampunk." The many flying machines, real and very imagined, are some of the most dazzling of the director's career. 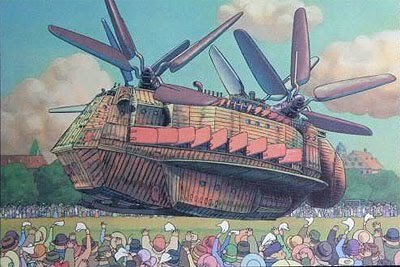 This film was a companion piece to a Ghibli Museum exhibit titled, "Castle in the Sky and Imaginary Science Fiction Machines." This exhibit used Studio Ghibli's inaugural film as starting point for examining, and romanticizing, the early years of flight. 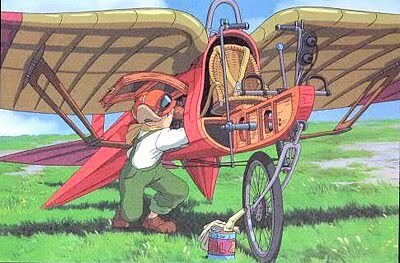 One animated sequence actually shows Pazu putting the finishing touches to his aircraft that we saw in the 1986 movie. 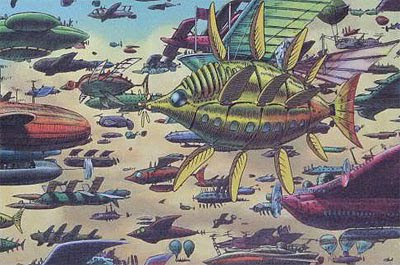 And to a great extent, Imaginary Flying Machines plays out like an extension of Laputa's title sequence (the theme song plays in my head when I look at these images). 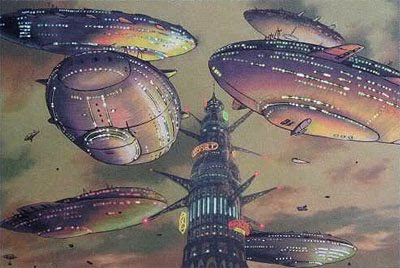 The extravagent painterly style, the use of pig characters, including Miyazaki's voice-over narration, all evoke the feel of Miyazaki's manga comics. There is usually a dividing line between his comics and his animated movies; in terms of complex compositions, framing and layouts, detailed cross-sections of machines, more evident use of pencil and brushstrokes. 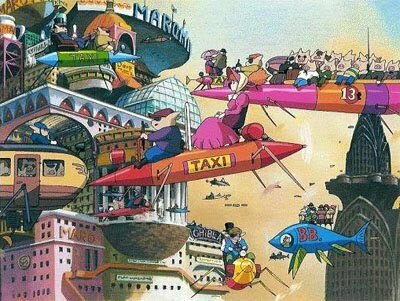 One can easily see the comics form as Miyazaki's true vision, the goal his animations aspire to reach. And here is a rare opportunity where the two forms meet; perhaps this is only attainable in short-form animation? Time and budgetary pressures for feature-length animation would probably make this visual style impossible. 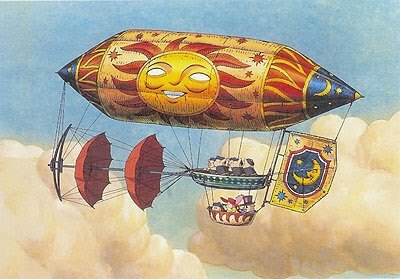 It's important to remember just how recent an invention aircraft are, and how old the dream of flight lived in the human imagination. Miyazaki's visions aim back to those older romanticisms, those lofty dreams of what it must be like to fly like birds, and dance among the clouds. The reality of commercial flight, by contrast, feels mundane, almost ordinary. A flight from Minneapolis to New York is no different than a ride on the light rail train to the Mall of America, or a bus trip to Dinkytown. It's all so damned boring and soulless, the product of a boring and soulless civilization. 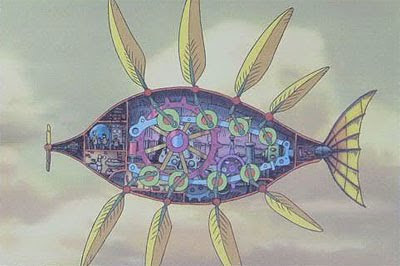 I would much rather take a ride on Miyazaki's imaginary flying machines, thank you very much. I have no doubt that, one day, we will have a home video collection of all the Ghibli Museum short films. 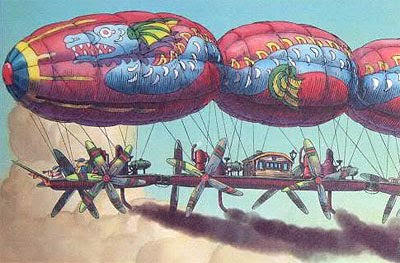 On that day, Imaginary Flying Machines will achive its much-deserved fame. This movie deserves to be seen.